I’ve admired her work for many years, even when she left us to teach and paint in Arizona a few years ago. So happy to have her back! Her oil paintings scream color – in two ways. 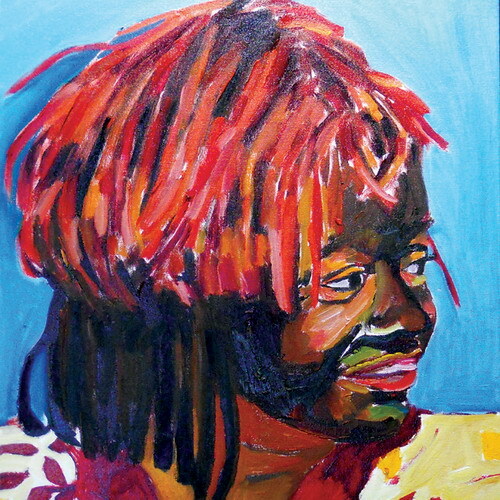 McIver (pronounced Mc-EEver) splashes bold colors on her canvas and she deals with racism head on. 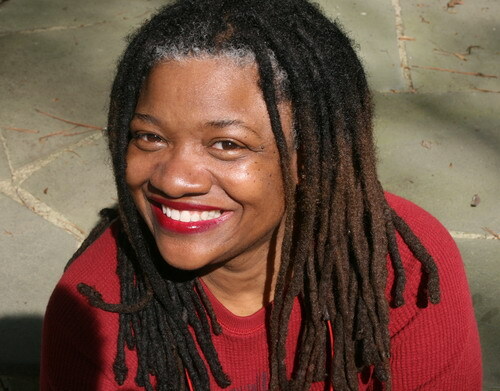 Our first brush with her, so to speak, came late last year at Golden Belt, where she keeps a studio (she’s an art professor at North Carolina Central University). 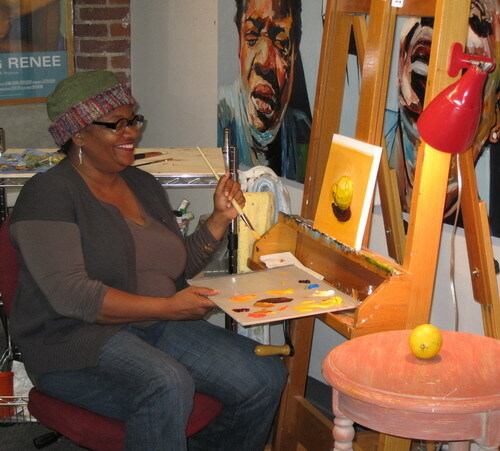 During a Third Friday, the monthly open-studio event, McIver gave a painting demonstration. We the audience were wowed. Imagine watching an artist you admire show what she does and how she does it, step by step. A couple weeks later, Lina and I went to the retrospective on her at the North Carolina Museum of Art in Raleigh. “Reflections: Portraits by Beverly McIver,” up through June 24, covers her last decade. The paintings commemorate McIver’s life and the lives of those closest to her – her late mother, who died in 2004, and her sister, Renee, who is mentally disabled. The sisters also are the subjects of the HBO documentary “Raising Renee,” which recently came out on DVD. McIver is brutally honest about the challenges of being a caregiver. Then last weekend we strolled over to Craven Allen Gallery in Durham to see her “Small Works” show, up until May 5. What’s particularly neat about this one is it includes some mixed media works and monoprints, as well as McIver’s signature oils on canvas. Some of the mixed-media pieces and prints were priced at less than $1,000, though the oils ranged from $6,000 to $15,000. A bit out of our budget, but remarkable work! We are so, so fortunate to have this major talent in our own back yard. I can’t wait to see what she does next!